The crash wave I've been expecting for a week appears to have finally begun. The markets showed some strong downside in the last two sessions, and did what they needed to in order to fulfill the expectations of the crash count. The triangle, which I always believed was a "fake," but I showed anyway at 15% probability (since I can always be wrong), was finally eliminated from contention on Thursday. I strongly disliked that count from the beginning, and didn't even bother to draw a chart of it yesterday. Like a houseguest that overstayed its welcome, I'm quite happy to see it go. The smallest leg down may be complete, and we could see a bit of a rally on Friday to wrap up OpEx week. Despite the fact that ES futures (SPX) are up, when I look at the charts, I have the continued "gut feeling" that there may be some surprises in store on the downside. Nevertheless, I have labeled the charts conservatively, and a snap-back rally today may be in the cards. 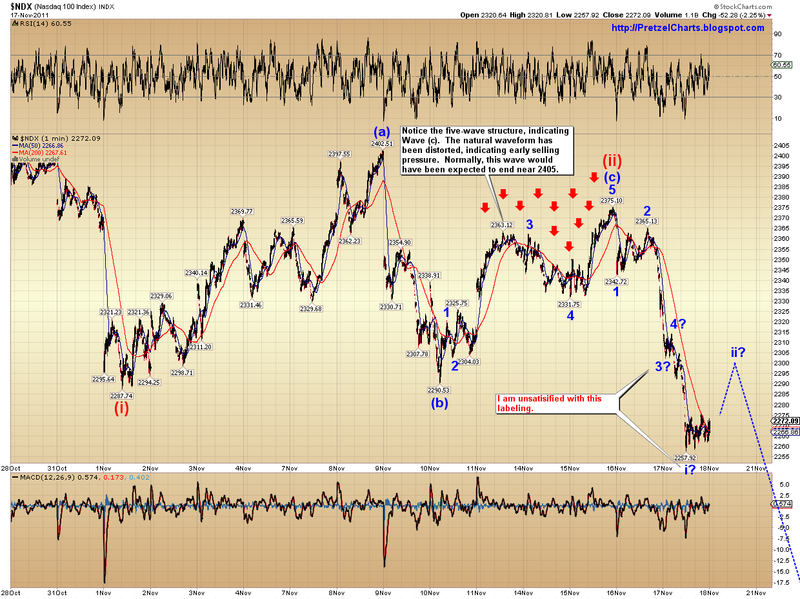 Under the alternate SPX count, I was expecting a five-wave move up for wave (c) of (ii) which never materialized. When a wave fails to meet its minimum expectations, this is called a "failure" or "truncation" under Elliott terminology. In the NDX chart above, you can see that the NDX did form five waves up, however, even there, the wave fell well short of the target. You can almost see how the wave is being "bent" downwards, which caused its expected targets to fail. It's almost as if the wave were being bent by a strong current; this was a precursor of high selling pressure, and these types of upside failures are something we will almost certainly see more of during this third wave down. 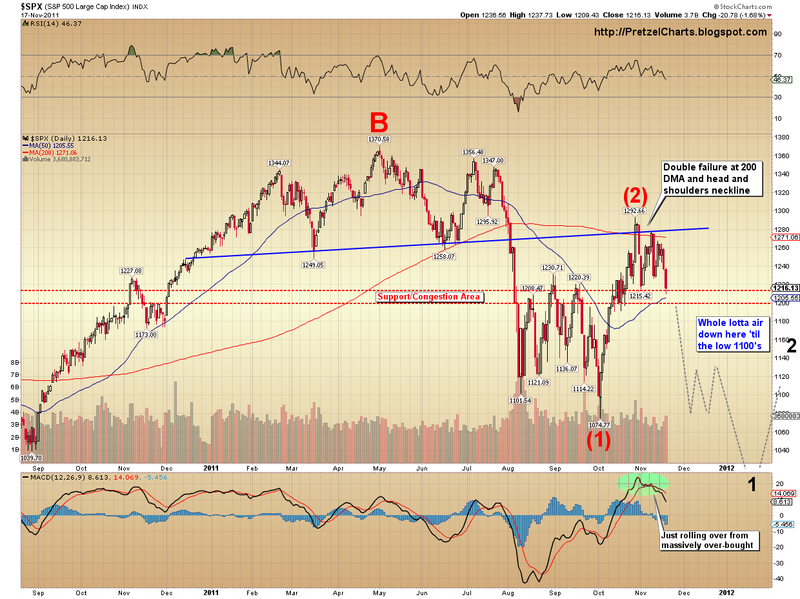 Below is the adjusted SPX count. I have moved the wave (ii) label to line up with the NDX. This makes quite a bit more sense now, and explains the challenges I faced in interpreting some of the more recent price action. The corrected count now reveals that we are only just beginning red wave (iii) down. Note that we are now able to move the knockout level down to the red wave (ii) high. The final chart is the "bullish alternate" count. This count would be short-term bearish, long-term bearish, and bullish in-between. This count allows for the possibility that we are in the process of forming an ABC correction off the October 27 high. Based on the different markets I've studied recently, I would be shocked if anything short of central bank intervention could make this count a reality -- but stranger things have happened. I am only assigning this count a probability of 15%. In the near future, we will be able to determine some key levels to watch for validation of this count. Currently there is not much we can do other than be aware of the possibility. Assuming my preferred count is correct, market surprises going forward should be to the downside. In third waves, momentum indicators reach oversold and stay there. Bounces that should materialize, often don't. The SPX still has key support in the 1190 area, and as I've said in every update for weeks, I expect that is still the level to watch. Once that is broken, there's very little support in close proximity beneath it, and the move down should accelerate. Trade safe. Feels so good to hear that surprises should be to the downside for a change (positioned short). Your latest update is rather ominous, Pretz. And at least we now have a much clearer picture than being caught in the triangle. For me it was a mindf***. Nothing made sense to me other than it was apparent that the pros on Street made it apparent that they had no confidence past 1,265, which portended that we'd go much lower soon, I suppose. The street doesn't make any money if we don't move to somewhere. And if up isn't it, then down is where we're going . . . I won't be surprised if opex makes for a green close today, but I will trading this one very carefully and lightly. And there is no chance that I'd hold a long position overnight.Usually when the market is blatantly signaling BUY RIGHT NOW (as it is this morning), it's a trap. If anyone remembers, we got the same sort of things a few weeks ago at the end of a string V-shaped reversal days that would leg strongly higher after a short waterfall move down in the am session (remember those?) We retested the 200 dma the second time, and the market did deliver on it's obvious buy signals FOR THAT DAY ONLY. Then the indexes tanked the next day, wiping out the previous five days' gains, so anyone who bought and chose to hold long during that maddening run up was left underwater after it was all over. That whole five days' worth of trading was one massive trap.I also think that just about every pro trader and market analyst MUST see the writing on the wall by now. The market has a near-future date with retesting the 50 dma soon enough. And once we cross that, it's a long ways down from there.I may trade a few minor long positions if it's looking like today will involve a ride back up, but there's no way that I'll be holding those past the close, or even the last hour of trading, when I suspect that street pros will be wrapping up any long positions they may want to divest. With the market signaling an up move amidst THIS worldwide financial backdrop, I do interpret it as an eventual trap. Whether it's an intraday trap that reverses today (seems unlikely, but who knows?) or one that gets sprung on an overnight decline on another ominous headline or in the futures market is what I don't pretend to know.Looks like we will be gapping up into the 1,220's at the open. Will be very curious to see what happens after the first half an hour of trading. I will be looking for the reversal. Very informative...."like an unwelcomed houseguest".....not a freudian slip is it? :) Thanks again!!! Thanks Pretz! What do you think the odds are that we head south today, no meaningful bounce? For educational purposes only :). Did you say that there's an edit function with Disqus? My paragraph breaks onthe last post did not who up. Looks like we will at the very least backfill the gap from the open. Will be curious to see if buyers pick things up from there. I'd be looking for the reversal now that we are back at 1,216. My belief is that buyers tend to be more than happy to let sellers have an half hour of play time on small gaps up like today to bring things back down to create a more ideal starting point. woke up, saw futures at 1230...was salivating to put my shorts back on and by the open, they had given that gain up....not going to chase unless we break 1190. I think we might see 1204 today before we rally back to the 1230s. There are a lot of oversold ST indicators out there that say we need a little bounce. But then again, a lot of people think we need a bounce here so it may not happen. I'd say better than 50%. I really think we're still in a fourth wave, at best. What "scares" me is that the pattern in the ES futures is all 1-2 1-2 1-2 NO third wave yet. That's why I wouldn't be shocked if we just flat out crashed on Monday. "In third waves, momentum indicators reach oversold and stay there. Bounces that should materialize, often don't." Ah, that makes it readable, lol. 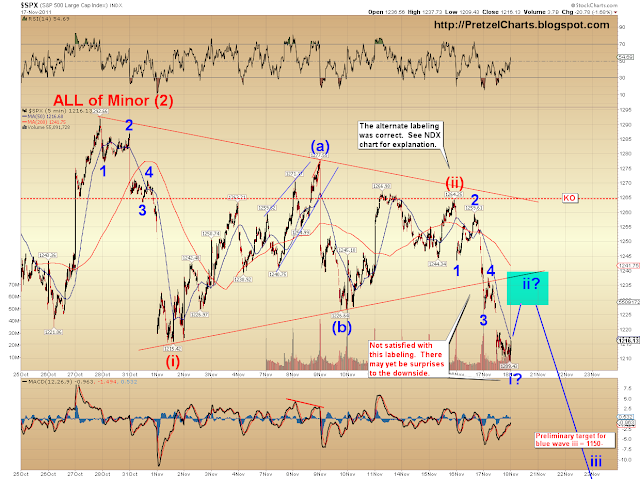 If this is still a fourth wave, this might be c of 4 now, getting close to completion. It's a big "might" though. Thanks PL! 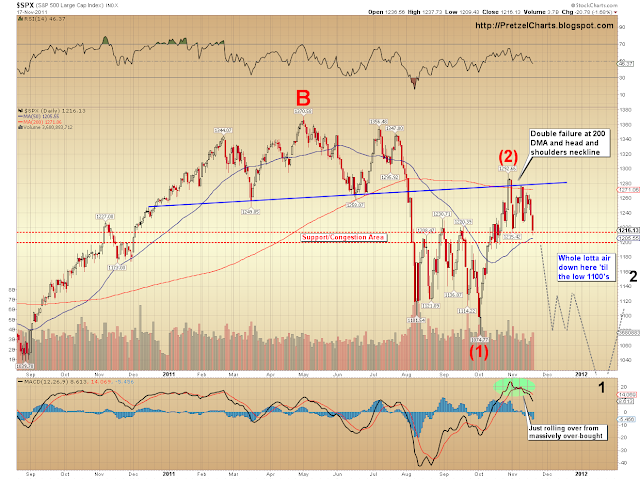 Do you think it is possible that the blue 3 of blue i in your SPX chart is again sudivided? yep, you nailed it...I'm willing to chase a break but my conviction is not quite as high as your's on the crash right here. Your analysis is awesome, and I'm still short (just to a lesser degree)...if it keeps dropping I can deal with it psychologically becuase that means it has much further to go and I haven't missed the train, but if it rebounds for whatever reason, I'll be beating myself up for not taking some of my profits here. I'm sort of in capital rebuild mode...less concerned about thishitting the homerun right now.. I guess this is me trying to get a handle onthe emotional side of my trading. Yes. I also think it's possible we're forming an extended fifth. I really labeled everything very conservatively... but my gut says there's going to be some downside surprises. Holy cow, blog had 900 hits at 9 a.m. EST. Another new record. Everybody probably wondering where the update was, though, lol. Somedays, I'm amazed I even get it posted before the open. Haven't missed one yet, though. nomad, i like it....does that make me a contrarian to the contrarians? now my head is spinning. Nothing wrong with that. Plenty more opportunities coming down the road. Wonder where TJ is? Didn't see him at all yesterday. Pretzel thanks for the update. Watching the following in case we're just in a range and get a Thanksgiving snapback rally. Notice the last time we sold down to these levels on the SPY/^GSPC we had a strong snapback rally. This is probably a wave 4 triangle within wave A of 4... unless it's a wave 4 triangle within wave A of 4. Hmm. The curse in 3rd waves is that when just one oscillator says oversold, another nested oscillator is in overbought territory already so selling picks up to supress the "expected" bounce. This goes on until all possible oscillators are in overbought territory and then the market plunge again. a thought....when i click on an unnamed link, it takes me away from the blog. Can it be configured such that those links open a new window? Yeah, but if my count's right, this is a much different wave structure now. We shouldn't get anything approaching the kind of rally we got last time we hit 1215. I currently wouldn't expect much more than a one or two day snap back. No clue. I can try. really? what time frame? 5 min? Oh.... yes captain. Will do. FRANK SAID: The curse in 3rd waves is that when just one oscillator says oversold, another nested oscillator is in overbought territory already so selling picks up to supress the "expected" bounce. This goes on until all possible oscillators are in overbought territory and then the market plunge again. The other thing most people forget, or don't know, is that virtually all crashes occur from deeply overSOLD readings. Good morning, fellow bears. Watching the action (or lack thereof) on the 5-minute SPY chart ... seems pretty random at the moment. Kind of expecting a retest of yesterday's lows but, so far, the bulls seem to be holding 122.00. No sure whether I'm seeing a short-term wave structure develop yet ... maybe I'm squinting too hard (?). Forgot to say on previous post this is not a recommendation to buy or sell securities. Awesome post again. I love this place! Nice. This is actually a good potential place for this wave to roll over. Looks like it might have been a double-zigzag up. Not sure yet on that, though, but if it was, this would be ideal, +/- a point (SPX). little profit. But again, I tend to think we're in Thanksgiving rally mode with stops in place of course! vix coming off nicely....just bought back a little bit of my VXX. waiting for another leg higher to add to it. I'm not going to trade this until I have better confirmation, but stochastics on 1, 3, 5, 15, 30 min charts are suggesting rollover here (at SPX 1,223). 60 min still trending up though. RSI and MACD on 30 and 15 trending up. Trending down or neutral on 5, 3, and 1 though. If it's a reversal, it's looking weak so far. Buyers will want to hold 1,220 and let sellers know that we're still going higher from here. To me, this seems the big 'test' of the morning so far. lol, ok, i'll stop now. Morning Pretz and fellow traders. So your blue 3 and 4 count could be off? I assume then you are thinking that where wave i finished might actually be 3 and then we're in 4 now with 5 to complete i yet to come? Otherwise we are in wave ii now. Just clarifying for my simple mind. R2k was weaker at the open but after the leading indicator data came out it is back to outperforming yet again. Hopefully it breaks down one of these days. It makes me sad. Rocky, you seem to know how to trade the VIX rather well. I am pretty clueless there myself. At some point, I'll probably ask a few questions about how you enter and exit your trades there. I rather appreciate your point of view. And I don't think that posting trades is hogging myself. Pretz recently posted that he wants to see the board be an active place for discussion. 'Thanksgiving rally mode' sounds like rather wishful thinking to me, but it's certainly a perspective I want to consider. I don't think that any pro trader on the street honestly believes that we don't have a date certain with 50 dma lurking not far below. And rather soon. The likelihood of another bad headline out of Europe, weakness in Asia, a dollar rally, etc. is simply rather extreme. And overwhelms any feelgood notions of a happy Thanksgiving run up. That sort of thing is the stuff of healthier economic times. And any pro knows that means we find our way to 1,180 once that news breaks. This wave's a lot of overlapping corrective slop so far, and while I'm not sure if we make new lows TODAY, so far is looking like we're guaranteed new lows pretty soon. NDX definitely the weaker sister today. Looking pretty anemic right now. Thanks Frank! SPY rolling over on the 5 and 28 EMA on 3 minute chart here at 122.35 (that is also the current Volume-Weighted Average Price (VWAP)... need to hold here and get back above that Pivot at 122.49... Trendline Resistance now at 122.66 fwiw. Anyway, promised would stop hogging up board so have a great weekend everyone! well, it's not very sophisticated if that's what you're wondering. I watch moving averages and vix relative to the market. If I'm seeing too much complacency (overbought conditions) and a cheap vix but I'm anticipating more downside, I'll put some on. 'Cause just to reiterate, your posts are appreciated. Battle royale at 1,219 - 1,220. Whatever happens here probably frames the rest of the morning session. This is just too uncertain and uncompelling for me to trade, but I'm *guessin*g that opex wins out here. Sellers know that they don't have to win today. And if they let longs have today, they can enter new short postions from wherever buyers run it up to. Which I suspect is not past 1,240. And which would also keep the market lulled into thinking that there is not a Black Monday coming. All of this is just thinking out loud. SPX looks like a rising wedge at the moment. Nah Pretzel :) I just think we'll see some market manipulation to the upside into the Thanksgiving holiday on light volume over the next week. I'm bearish overall FWIW :) That said, I'm not ruling out a Christmas rally either. Have my stops in place at 122 on the SPY just in case I'm wrong in the short term though! Rock - fwiw - my look at R2K has it bumping up against the downtrendline right now at 723 -- if we can't break thru there then look for more downside ... if we do - we will most likely go up to the top of the channel near 740. Thanks, PL, that's what it's looking like to me. Sitting on my paws and being patient. If we found 1240 today, I would be going all in short. A total gift if you ask me. While I'm still 60/40 on the big collapse happening here, I am 100% that we must test 1190 even if we're going to find new highs....that's my trading thesis atleast. Three and five min stoch just turned back down after coming off the bottoms. Very bad sign for buyers. If I had gone long at 1,220, I had have bailed on it by now (1,218). Sellers seem to be choosing to pounce when all the ST indicators were pointing toward going back up from 1,219. Very smart. Ah, and the IT 15 and 30 min stochs are rolling over. With RSI trending back down on both. Not looking good for longs now. Sellers are playing this rather well and schooling hopeful longs at the moment. You may have been right with your first call for not much of a bounce, Pretz. Being like 4 points and 30 minutes late is still pretty much right on the money in this game. Here comes the shake out! Same time, same place as yesterday only in reverse I suspect :) Still holding even though we touched 122 on SPY. Okay I'm really done posting now... haha! Shatner continuing to negotiate higher prices on my PCLN puts. Price...line Negotiator! PCLN gettin' very close to the cliff dive point. Pretzel, so the breakout on 11/8/11 is a false breakout? Starting to look like that mighta been it for the little rally. Pretzel, are we in blue ii of the red iii or are we still in blue 4 of the red iii, SPX? 'spectin' PCLN to take 460 first, then 400, then the world! BWAHAHAHA! great chart, even though I do not even look at the npx. Imminent debacle fall is nigh, looks like to me. However, my primary re-entry target markets right now (I nearly fully cashed out yesterday, in mid-afternoon), are silve in the high 32 dollar range (anything above 33 dollars is a total gift to bears, IMO), but now I am studying and entering dec puts in what I consider the most overbought (in oct-nov 2011) american market, and still not understanding reality---usa new homebuiders. SPX just dropped into the red, if just for a moment. I'm really liking the chances of having our third straight close in the red, which we have not seen since Sep. We'll see what happens after Europe closes. Well, Frank, been trying to figure that out myself. Pretzel you keep pulling me back in! haha Seriously though... gotta get some stuff done around the house. SPY new lods. All stopped out at 121.80 S1 is 120.82 FWIW in case we really hit the fan. nice call there...I considered a PCLN short but decided to commit my capital elsewhere. Any other favorites for cliff dive right now? Feels impulsive to me this dive... smelling like the nested blue iii of the red iii? Great call on silver, btw! Ha, ha. I know EXACTLY what you are talking about. I think the above process runs through all lines of work, but probably most prominently this this one. great npx chart below, PL, even though I do not even look at the npx. Imminent debacle fall is nigh, looks like to me, therein. pretzel - if we break yesterday's low....does that mean we are in wave 5 down? 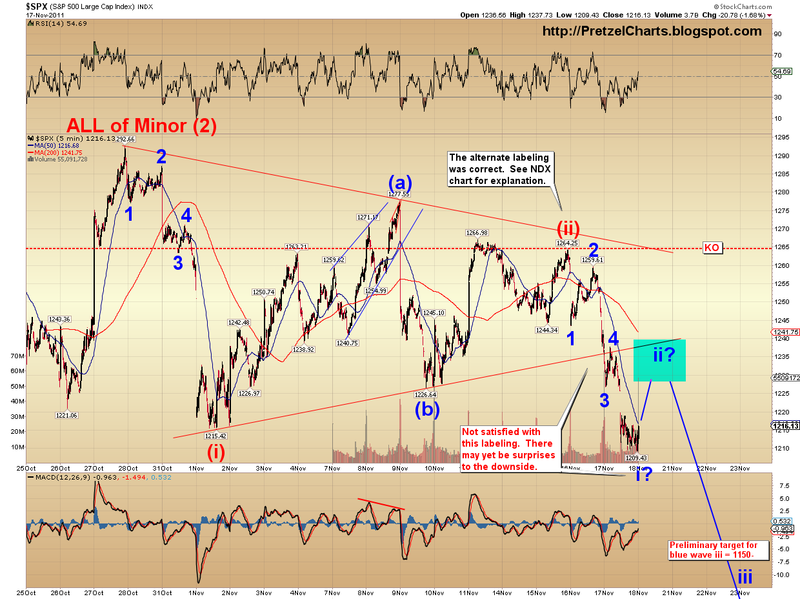 or can a wave 4 actually make a new low? btw, I do not have any edit button, to correct typos. Do any of you have it. It's a browser issue. You have it, you just can't see it. Highlight the page around your post, and you'll see it. Seems like a lot of the folks here trade very short term (less than a day). I trade monthly calendar spreads for theta decay so, I'm always looking for a trading range each month...anybody else? This is now looking positively brutal for bulls. That last twenty minutes of trading is the sort that makes a buyer completely give up hope. The long trail of little bounces on the bottom ranges of the 1, 3, and 5 minute stochastics with the 15 and 30 minutes rolling over. It tells the whole story. And with RSI's everywhere pointing downward. The best a long can hope for is to wait it out . . . or join the selling party. And here we are back at the threshold of 1,210 again. I think every pro understands that breaking 1,210 means a rendezvous with the 50 dma not too long after that. Longs have to definitely be feeling softened up and demoralized after what just happened. That was a smackdown at a rather crucial juncture. and did that move off 1222 look impulsive? It would usually mean we're in a new wave down -- however, B waves can exceed prior highs and lows. So it's still possible for it to be the 4th wave -- within reason. Obviously, if we drop 10 points, we can rule that out. Also, as I posted earlier, I suspect that was probably it. Problem is, stupid market formed another double zigzag, so I can't read much until we take out yesterday's low with authority. But the corrective pattern of the rise guarantees new lows -- either today or Monday. silver had minor resistance at 30.70, I did not mention before, as I always look at the macro, and not the micro, as most do herein (you look at both). That minor resistance was tested and held, yesterday. Now silver is trying to rise, with a 700 pound gorilla on its back (gorilla's name is 'deleveraging'), and I would consider it a modern miracle, if silver can get can even to mid $33. but when it fails again and soon, IMO, its an express train ride down to 27 buck area, personal IMO. Not trading adise, it's my opinion. Prices of copper, steel, and lumber dont' seem to suggest a rebound in homebuilding any time soon. But maybe stocks lead commodities? That didn't work for me, and that was on two different computers with different browsers. how do I 'highlight the page around my post', I still see nothing anywhere. And if that lurker is a chick, and not too old, tell her to send me her dirty pics, I am a pig. I do a lot of compounding with ES short term trades. Sometimes I'll take a longer position swing trade, but I'm too averse to drawdown for too much of that sort of thing. As this wave gets cooking, though, I'll go into short-and-hold mode. Rocky, re: did that move down look impulsive. Basically, yes. It's one of those moves that I call "sort of impulsive... or something." Not clear enough that I can be 100%... but it would qualify. Pretzel, hypothetically speaking, where would a good entry point on the PCLN puts be and how do you see it unfolding in the short (1-2 weeks) and the medium term (3 weeks to 6 months). Thanks. hrmm looking for a good potential entry point today for more shorts in case of crash monday. any thoughts? Hypothetically speaking, if that thing does what I think, there might not be much for bounces. I'm up over 100% already since... I think it was Monday, would have to double check. Anyway, that's assuming it does what I think here. I only took a small spec position on some OTM puts, 'cause I think there could be 1000%+ there. ST I think it'll take 460, which'll lead to 400, which should lead to sub-300 not too long after. If I'm wrong and lose, so be it. NO, Typical Clueless American, it's the other way around. Extremely overpriced commodities worldwide, are already leading uber-overpriced equities down. And only CHINA was the nature of the latest temporary 2-year boom in construction staples (which is now OVER), and not poor humble, soon to be indentured servant America, soon to be relegated to the ancient history, of past great civilizations.. New homebuilders are all banrupt, just like a ll amarican bigbaks., since late 2007, when the cridit bubble burst. Well, for one, don't bank on a crash. I'm just saying one wouldn't surprise me, based on ES structure. But ES is questionable sometimes. Beyond that, I don't have a good enough grasp of the tiny waves at the moment to offer you anything other than what I've posted already today, so use your best judgment. NOT TRADING ADVICE, of course. your reply system suks, Pl, I cannot even read my own replies before I post them, much less edit them. ----Correction, to above reply----New homebuilders are all bankrupt, just like all amrican bigbanks, sonce late 2007, when the credit bubble burst. (And I add now---credit bubble built over 40 years, since gold window was closed in 71, and gold was allowed to be bought again in 76, setting up the beastial expision of fitas, that has come to full frution in orgiastic fashion, in earlty 21st century). I am thinking the same. Being already short I am thinking that time is on my side today so I was thinking of watching the balance of the day. I know that is is down a bit but I sure would like to see the 1190 cleared out. I too am interested in what Pretz and others are thinking here. Correction to above, due to your system failure to even let me read what I wrote. ('...setting up the beastial explosion of fiats, that has come to full fruition in orgiastic fashion, in early 21st century). After lunch....wonder how many martini's were consumed today. We just going to see/saw into the close with no movement? For the most part, just avoid using the reply button. It works better if we just post linear anyway, like with the old system -- unless you're replying to something right near the top of the thread. Otherwise, I don't see the posts. Colorado, your thesis about longs playing keepaway from 1,210 makes a lot of sense. I don't think sellers have any immediate incentive to waste firepower here, when on Monday it may be cakewalk to go lower. hold and sell overpriced inventory to the gulllible while keeping plenty of longs still trapped or holding and hoping. Sellers may have accomplished what they needed to with that smackdown from 1,219. Market today's about as exciting as reading a washing machine instruction manual. Brian, last Friday was for most a three-day weekend (Veteran's Day) and such its trading action might not give a full picture. is google perched on a cliff? i sold a little short. Pretzel, reference PCLN. I was looking at the Dec 450 and the Jan 430 puts, hypothetically of course (LOL). Reading the 6 month A/D and MFI it appears the MM have been unloading big time (granted I am a newbie at this). Thanks. 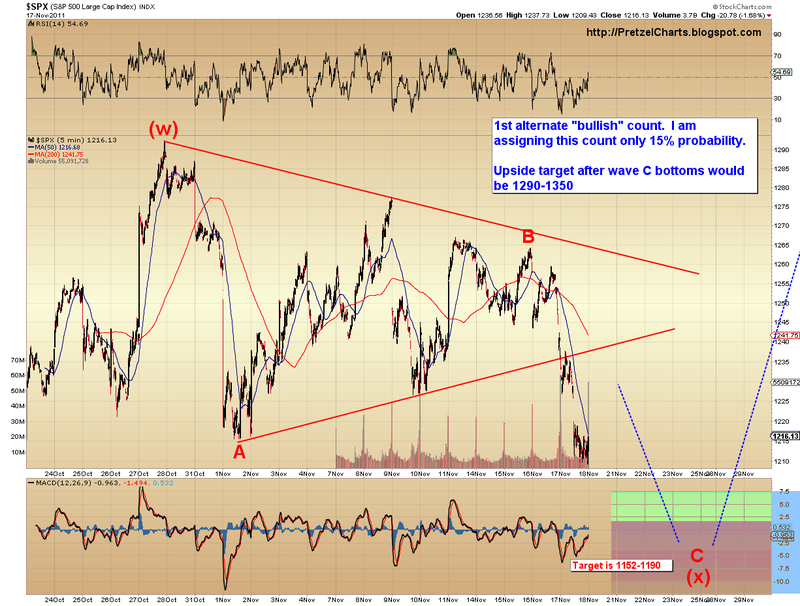 Anon20, what's your downside target for SPX at the bottom and when will we hit it? Thx. Hypotheticaly, of course, and IF I'm right... those would prolly do ya just fine. All depends on if I'm right, obviously. I disagree. today is extremely interesting. I am slowly adding on. think 87, 29, dutch tulip mania, mississippi scheme, south sea bubble. this looks like a turkey that cant fly. yet trying hard. but a turkey cant fly. Pretz, arnie here! Smashing update, especially considering ur in laws are in town. As you know, I shorted yesterday for the first time ever. Just a tiny amount, but liking it! Bull turning bear??? Wohahaha. Anyway, somehow I believe -for what ever reason- that the market will go somewhere between ur prefered count and alternate "bullish" count. Why? As you said: Fed intervention. I am sure they know all key support resistance levels too and once they fall they know too "Armageddon" may be upon us. We'll then rebound on the joy of more dent and printed money to some insignificant level before the inevitable happens: full blown crash. As you and many others here stated, the market tries to take as many down as possible, and such a fake rally will? Or? Eitherway, all long term technicals have even gotten more bearish after yesterday. Agree with PL. Bank on nothing except trying to breathe, shtt, eat, sleep, find a cave. Primal time is harking near. I don't think the Fed would bother stepping in anywhere near these levels -- unless the credit markets get a lot worse... in which case, Fed may not matter. P: "Market today's about as exciting as reading a washing machine instruction manual." As much as we enjoy your intra-day comments, it might be a good one to get some rest. Yea, I am not the greatest at price action, but I would think that the only way to see substantial downside would be for the bulls (mostly market makers I would think) to become careless. I would also think that if this happens it would be late in the day (1 hour to 1/2 hour left in the trading day). If it doesn't happen then I would not really bank on a gap lower on Monday either, but I think that these "critical levels will be a whole lot easier to cut through. Yeah, I was just thinking that. Can't be sleeping all day w/ the in-laws around. Dat wood bee roooood. Hmmmm. I agree that it was not the 'full picture'. But the three day weekend argument actually supports my thesis: with the banks and bond markets closed and it being a light trading day, serious buyers could have done whatever they damn well pleased. NO ONE was going to stop them from a run up to 1,280. So what stopped them? I think it was pros taking the temperature of the market and knowing where to stop. When the buying reaches a stopping point that isn't caused by push back from sellers, it tends to say a LOT about what the true confidence and calculation of the buyers happens to really be. Anyone have thoughts going into the close....creep higher? I thought it would settle around 1215, but there seems to be a desire to push higher and close above the 1220 mark. rudeness has always worked for me, along with drrgs alcohhol and dirty wemen, same it did for hunter thompson. Stick with it, you can sleep it off in weekend, or if not I'll view you as a wimp. Grnad supercycle degree, remember that, never to be seen again, in your life. And all you will remember in retrospect, is that you wimpily slept through it. Decide. Logic 101, act or do not act, both are actions. My guess is it looks like it's coming down now back to the LOD, if not it can retest 1221 or possibly shoot up to 1225 and crash Monday. Agree Spiker. Watching paint dry. That bear smackdown to bulls between 11:30 and noon has pretty much set the tone for the session. Buyers cannot possibly have a lot of confidence at this point that a big run past 1,230 is likely. Not after that drubbing. And pros have played defense of a fall below 1,210. So now it's watching a game being played between the 35 yard lines. Very much in keeping with an opex day. This has not been a good session to ST trade much. I saw only two potential strong buying signals, but with the market seeming so indecisive and uncompelling as to a direction (so far), why bother? Yoh, Frank, I am not a timer, like CTP cycler was. All I can tell you, is follow PL on the spx, I am fairly on board with him there. Major life killer bust dead ahead, and totally gutwrenching unexpected, but I do not know the date. But it is unavoidable, IMO, from thousands of hours of study, and for a thousand reasons. As to silver shortterm, I already wrote my opinion somewhere below, so just dig downward, you'll find it. Okay, hmm. If this morning down was wave 1, that could count as wave 2 ABC now... bears could take a shot at it here, we'll see. Hey Expat, where do you live now? Get some rest. You've earned it. And we'll look forward to your preferred count playing out next week. Seems awfully likely at this point. NDX still completely unable to get off the mat here. I don't even need to post an updated chart: looks the same as it did a few hours ago. I think the only thing holding this market up is OpEx. Monday could be very ugly. CA, which is like living in a different country...LOL...spent many years in CO....aka...gods country...beautiful!!! Agreed, I shorted the ND100 futures when I woke up this AM, before I saw your update. Boy, did I love the confirmation! Yup, it is nice. Moved here from the East Coast never want to go back. Ok, so go dutifully serve your ringbearing weman, I understand. Me, I got rid of both mine, just because of that nonsense. Now I only take eager slave wemen, that obey or else (recall my previously intended avatar pic, and that was the mildest I've got). When I write my book on the end of the grand supercycle, day by day, I'll send you a free signed copy, so you know how it went, since you slept through most of it, or were attending soul-skkng inlaws). I lived between denver and boulder..broomfield to be precise.....So did you enjoy the game last night, or did you move from NY? Giant, Yankee, Islander fan from NY. But whatever, I love to watch the games. PL, if your wife has not already placed her handcuffs on your fast typing wrists, have you ever taken a look at the usa new homebuilders index, I opine that is it close to death. If the Fed steps in now everyone will still be saying "what more do they know that we don't." If they don't step in, it maybe too late when they do. Either way, I think the market will react poorly. Which one of the homebuilders do you think has the most downside....Lennar, KBH or are you simply playing the group? Alright, I do have to get some sleep now. Anon20, I'll look at the homebuilders index this weekend. Everybody, try to keep Frank from using the blog phone to call all those 1-900 numbers again while I'm gone. Frank, I'm onto you! A20, if it crashes as soon as I sign off, be sure and send me the first page of your book so I'll know how it went. Looking at SPY puts, the FAR bigger market at risk is OTM puts today. That would have a lot to do with MM's wanting to hold things above 1.210 today. That all goes away starting on Monday. A close around 1,225 would make the most sense for the 122 strikes expiring worthless and the 123 strikes being not worth much. Looking ahead to December, the 120 and 115 strike SPY puts have a HUGE open volume. 467K and 420K respectively. Meanwhile the SPY is rather light on open volume for all call strikes for December. I don't take SPY options as reflecting general investor sentiment, btw. When there are nearly 500K contracts outstanding at two key downside strikes, that's not just retail guys buying 20 contracts here and there. When I grew up you went to a fight and a hockey game broke out. That should belie my age. Of course that was 3 grown kids ago. :0 Mets were fun to watch in '85, but since are a drag. Watching the market thus far today is like watching paint dry. I am so bored. I keep telling myself please, please, please, don't do something stupid. Dead men don't wear plaid. there are much better meat options than 900 numbers, if you only search. 1. )Fed Intervention - which has a low possibility. They tend to react and the economic news shouldn't justify more than leaking of Fed Speak, which is baked in. b.) Europe gets it's act together (had a hard time typing that while laughing). Thanks for this site PL. I hit the button, you helped me earn it! I saw the Mets in 69, so that tells a little. :) I am way ahead of you on something stupid...todays lack of drop hurt me bad...I agree with BH...the bulls are going to hold on to 1210 and my question is...do we rally into close???? I pick and choose put options as they appear fat to me. Rather than get into specifics, take a look at the big usa new homebuilder charts yourself, and look at longterm resistance levels, look at 200day ma resistance, look at withering volume on big upmoves (sucker money), and if you are a real hard worker, look at what happens internally, with the owners of the farm. Are they dumping their stock higher prices, insider selling? Are they retiring, as one particualr company president recently did? Use common sense, in finding the prey, ready for slaughter. Other remote possibility, IMO, is Merkel/Germany agree to let ECB be buyer of last resort. But I think they will wait until more blood in the water for that. If EMU reduced to only 'strong' northern countries, EUR will strenghten, bad for German exports. If world goes into great Depression, that's also bad for German exports. So I think German pols will try to sell citizenry on 'limited' ECB money printing at some point. But not yet. And whether it will amount to a hill of beans at that point remains to be seen. I don't think a rally is in order for the close (weekend moving into a holiday week), but if it's gonna break it better to do so now. Left with some old puts, Expat? me too. I thought that it might falter because although the market makers don't want it to fall I also didn't think that they wanted to enter the weekend long. But maybe I am missing something. thought we might fall to 1215, but I am not even going to get that! You might, usually on the close if the market rises the 'buy' mocs are executed leaving the sells for the end. hard to explain and even harder to predict. There has been whispers from the FED of coordinated efforts with the ECB. What happens if they both print at the same time? I assume it just kicks the can again... but can't wrap my head around how that plays out .... Start buyin Chinese currency and learn to speak Mandarin...? I don't think the Fed can justify stepping in with another round of QE until there is a sense of true panic and the indexes have at least one or two waterfall days. And oil at above $100 makes that really hard to justify. I would think that below 1,100; meltdown in Europe financial markets; and oil falling substantially is probably where QE probably be talked about with any degree of seriousness. I think Pretz is was right that the Fed was front running bad news and also introducing the topic now for further consideration later. Doji daily candlestick with no upper wick and holding for an even close while not crossing 1,225 on a day when there was a lot of ST incentive to get at least past 1,230 seems rather the equivalent of a third lower close in a row and the fourth lower in five days. Especially on opex day. Only trade I made today was taking meaningful put position in SPY in anticipation of a possible Black Monday. If there was a day signaling to hold something like that over the weekend, this was it. the current american fed is the modern version of the 30's depressionary era, the wizard of oz. under 3 trillion of actual fiat paper usa dollars exist. Yet, over 800 trillion dollars of world debt exists. 3 vs. 800. I go with 800. you can stick to your 3. I am betting on Goliath debt. You are worried about David with a pebble Screw david, it was a fae story, in real life, all goliaths win. fake, not fae. whatever. humans are dead. none of you know it yet. FYI, I am looking for a $200 dollar drop in gold real soon, from low $1700's, to low $1500's, to freak goldbugs. It's my opinion, and not trading advice. And silver to circa $25, +/- $2, since silver is weaker beta than gold. earlier you wrote "I don't take SPY options as reflecting general investor sentiment, btw. When there are nearly 500K contracts outstanding at two key downside strikes, that's not just retail guys buying 20 contracts here and there." I found this statement conflicting, because it appears that the large volume (500K; incl. some of mine...hehehe) indicate general investor sentiment, or??? Well if you are here, you probably aren't the 'average retail investor' to begin with. And I do think that SOME general investor sentiment is reflected in open SPY contracts, though I suspect it's probably of the more sophisticated general investor variety. But when there's large volumes open at key strikes, there's plenty of pro money in there too. The tell being the large open volume at the 115 strike. Well below the 50 dma and far away from now. I rather doubt that that far OTM and with a delta of -.3 is novice money. But for a pro who can see the writing on the wall and where this is all headed next, it's not exactly an uninformed place to place your bet. Pretz, quick question for when you are back at it. Does the last half of yesterday and all of today's trading look like another mini-triangle to you? Trying to make sense of what I am looking at. The super tight up and down waves in a narrow 4 point range in the last hour of trading was rather curious to watch, though by then I was pretty much tuning the day out and just checking in now and then. It could, but in Elliott triangles, every wave subdivides into a 3 waves form, with one complex corrective wave. Today's "triangle" didn't do that. I would be more inclined to think it's a fractal that's more similar to what we saw at the open on Thursday. Note how that move formed a triangular shape before letting go. It's a pretty common form to see -- that's where the larger wave count helps to know whether it heads up or down when it breaks. The micro waves help tell you whether it's a true EWT triangle, which helps tell you what it could mean. TRUE Elliott triangles are, without exception, continuation patterns. "Fake" triangles, like we had at the top of the market, may or may not be continuation patterns. Hope dat answers yer question! I definitely shoulda gone to bed about 10 minutes after the open. LOL, just read my own post down here. This makes about as much sense as a velvet painting would in the Louvre. btw, nice call here, Frank! "RE: my own apparent typo"
so today felt a lot like the friday after the "euro fix"
A big move on thursday followed by a day of nothing while a small triangle formed, and then monday the market reversed...I wonder if it repeats?...of course that reversal means an up day monday.